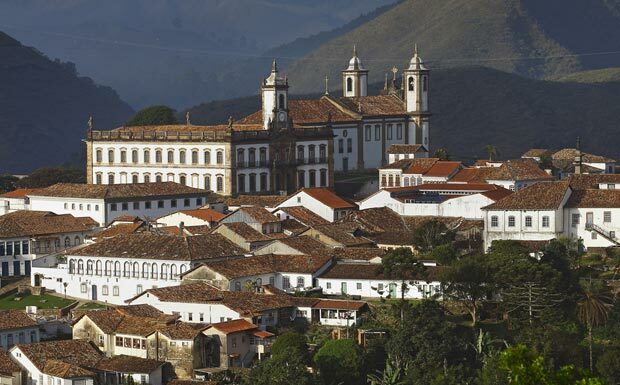 Ouro Preto, the political and administrative capital; Mariana, the religious capital. Located only 12 kilometers away from each other, so close that the men of the eighteenth century, in his ideal of greatness, thought eventually joined in the future. The governors, constituting residence in Mariana, in difficult times, times of permanent rebellion, and a bishop, D.Frei Domingos da Pontevel Incarnation, deciding to live in Ouro Preto to escape the pressures of the Cabildo. Located in a strategic point of the Espinhaço, mountain range that divides the watersheds of the rivers Doce and San Francisco, the two cities have their origins linked to the extraction of gold aluvionário. Once located the gold deposits Stream Tripuí and Ribeirao Carmo, settlement is processed with astonishing speed. In the year 1711 are established by the Portuguese Government do Carmo Ribeirão Vilas (Mariana) and Villa Rica of Our Lady of Pilar (Ouro Preto) the first officially recognized in mining soil. Following governors that succeeded in Vila Rica in the eighteenth century, deserves special mention Gomes Freire de Andrada, the Count of Bobadela. He managed the captaincy between 1735 and 1763, when he died. Time that coincides with the peak of gold production in the region, Vila Rica lived its phase of greatest splendor, characterized by intense constructive work, which earned him the urban setting that still retains today. The reopening to the cult of Pilar Matrix, rebuilt between 1731 and 33, served as a pretext to magnificent Baroque festivities in the former Vila Rica. A chronic-report, in 1734, with the title of "Triumph Eucharist," the author, Simon Ferreira Machado, an eyewitness to the facts, describes in exquisite language, and large details of flow, the celebrations lasting several days, with the point crowning the Blessed barroquíssima shuttle Sacramento procession of the Rosary of the Black Church for Pilar Matrix. The creation in 1745, the first bishop of the Minas region, whose territory was then dismembered the ecclesiastical jurisdiction of Rio de Janeiro, would result in immediate provides the Portuguese government, to raise to a city do Carmo Ribeirão Village , chosen for its head office. D. João V being the reigning monarch, the new city, unique in the region of Mines to get that dignity in the colonial period, was baptized with the name royal consort, Dona Mariana of Austria, Queen of Portugal. Essential linked to the occupation system and land use differences, conditioned by topography and urban functions assumed in the course of the historical process, the results centuada aspect of diversity between Ouro Preto and Mariana, which still impresses the visitor the two cities. As Ouro Preto is extremely rugged topography, occupying basically three hills separated by valleys, Mariana takes gentle slope of land, favoring the opening of parks and gardens. On the other hand, having Ouro Preto emerged from the merger of several camps scattered throughout the hills and valleys that make up its urban landscape, it presents a result slender land use profile that gives you the configuration of a continuous street, starting at Pass-Ten and finishing in Padre Faria. Mariana already has its urban layout ended regular plot. Like most of the historic mining towns of Ouro Preto and Mariana should maintain to this day the most of its architectural heritage built in the colonial period to two key factors. A negative factor that had positive consequences for conservation: the economic stagnation of cities in the region in the nineteenth century, with the closure of mineratório cycle. In the penultimate decade of the nineteenth century, a new economic development period stabilizes the region, based on coffee plantations, incipient industrialization and the introduction of railways, which reach Ouro Preto and Mariana in 1887 in early 1900s. Minas Gerais, which had hitherto remained linked to the aesthetic standards of the colonial period, open to the influence of new artistic trends, especially those resulting from eclecticism. The decisive factor for the conservation of the architectural heritage of the two cities has since the establishment in 1937 of the former Service of Historic and Artistic. The recent recognition by the UNESCO city of Ouro Preto as "World Heritage" of mankind does so more than ratify the awareness of Brazilians themselves, for over half a century, regarding the significance and continuity of the cultural values ​​of their territory, which they were bequeathed by previous generations.